Many people fail to realize that herbs like cilantro are not only great flavoring agents, but they are generally just as nutrient dense as the fruit and vegetables we eat. Cilantro, which you have likely come across when eating Mexican cuisine, is a great addition to all types of dishes. Also called coriander (specifically the seeds of the plant) or Chinese parsley, cilantro is related to parsley and has been used for thousands of years. Reportedly, it is one of the oldest herbs and the seeds of the plant have been found in ancient Egyptian tombs. It has been said that Hippocrates, the “Father of Medicine,”used cilantro for medicinal uses. “Being a reservoir of minerals and vitamins, consuming cilantro helps in improving the immune system, bone health, heart health, the nervous system, oxygenated blood circulation and overall cellular and tissue growth in the human body; which collectively all impacts human health,” according to one report. And according to a recent report, the American Journal of Clinical Nutrition states that cooking with some spices, including cilantro, may help prevent the cancer-causing chemical called heterocyclic amine (HCA). You might recall that this is a dangerous chemical which may be formed while cooking meats at high temperatures. So the next time you grill burgers at home, mix some cilantro in the ground beef, turkey or chicken. An added bonus is it will add great flavor and may encourage you to use less salt. Cilantro itself also contains antioxidants. One of these antioxidants is a flavonoid called quercetin. “In vitro and some animal models have shown that quercetin, a polyphenol derived from plants, has a wide range of biological actions including anti-carcinogenic, anti-inflammatory and antiviral activities,” reports the National Institutes of Health (NIH). The anti-inflammatory properties of cilantro in general may help relieve pain from toothaches, arthritis and more. A study from the Journal of Medicinal Food found evidence that both in vitro application and topical application to the skin of cilantro extract may help prevent aging of the skin that can be caused from the sun’s UV rays. Another health benefit of cilantro is it may prevent pathogens and detoxify the body. Cilantro naturally contains powerful antimicrobial agents. One of these agents is called dodecenal, which has proven to kill Salmonella bacteria that may cause food borne illness. So if you have a party this summer, add some fresh cilantro to the salsa bowl. 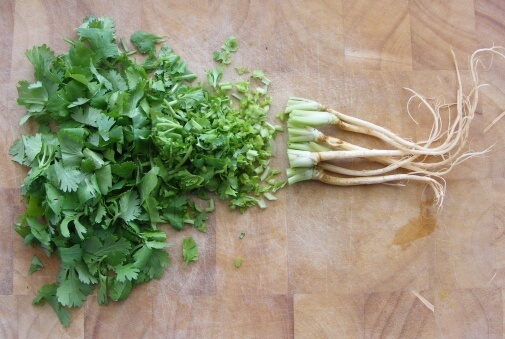 And as you probably already know, cilantro goes great with Mexican cuisine. The oil extracted from the leaves and seeds of the cilantro plant is said to be a fungicidal and can be used as a natural food preservative (Reportedly during medieval times, the Romans used cilantro to mask the smell of rotten meat.). Because of cilantro’s germ-fighting properties, it may help prevent harmful bacteria in the stomach from overgrowing that can cause an upset stomach and diarrhea. And since cilantro is an antispasmodic and anti-inflammatory, it may also help prevent stomach cramps. Several credible sources suggest that cilantro may help remove heavy metals, like mercury, from the body. A study with rats subjected to lead exposure showed that those who were given cilantro were better able to excrete the lead from their bodies. Cilantro also contains essential vitamins and minerals our bodies need to stay overall healthy. Just one-fourth of a cup of cilantro has 5 percent of the daily value of vitamin A. This vitamin helps with bone growth and reproductive health. It is also mainly known for improving your eyesight, skin health and cell regeneration. Calcium, 11 mg. Of course, calcium is important for building and maintaining strong bones and teeth. This mineral is also important for maintaining hair and nail health in perimenopausal and menopausal women. Adequate calcium intake may also decrease your risk for colorectal cancer. Folate, 10 mcg. Folate (also called vitamin B9) is a very important nutrient, especially for pregnant women, whose RDA is 400 mg. Folate may help prevent cancer and heart disease and improve mental health. Vitamin K, 49.6 mcg. This vitamin is critical for proper blood clotting and bone metabolism. It may also help maintain brain function, a healthy metabolism and may even help prevent cancer. Cilantro is so versatile and easy to add in your diet. It is great in guacamole, salsas, soups, stir frys, salads and more. One way you may not have thought of getting your cilantro is through a smoothie. This Cilantro-Mango Green Smoothie sounds very refreshing. Some sources say pregnant women should avoid cilantro. Small amounts may be okay, but speak with your doctor if you are pregnant. And due to the vitamin K in cilantro, speak with your doctor if you are taking any blood thinners. The vitamin K may interact negatively with this type of medication. To be safe, if you are taking any medications or have any existing health conditions, speak with a competent healthcare professional about incorporating cilantro into your diet. Don’t like the taste of cilantro? It is a stronger herb and may not be for everyone. The good news is there are many other herbs and spices to choose from which have similar benefits as cilantro!